Review: In the last few months we’ve really been treated to a lot of good entries at the movies. The dramas have soared (A Star is Born), the scary movies have been freaky fun (Halloween), and the romantic comedies (Crazy Rich Asians) have been at their fizzy best. The one movie we’ve been sorely lacking is an honest to goodness family film that isn’t filled with double entendres to go over the kiddies heads and lame-brained humor that make the parents shift grumpily in their seats. The arrival of The Nutcracker and the Four Realms signals the first purely PG movie I’ve seen in a long time, slightly too scary to get the golden G but worthy of consideration when planning a family outing to the movies this holiday season. Young Clara (Mackenzie Foy, Interstellar) is getting ready to celebrate the first Christmas with her family after losing her mother. Her father (Matthew Macfadyen, Anna Karenina) is too bereaved to be able to emotionally connect with any of his children, least of all his inquisitive daughter and when they arrive for a holiday party at the expansive manse of Drosselmeyer (Morgan Freeman, Now Your See Me) father and daughter exchange harsh words that only divides them further. Searching for a present from Drosselmeyer, Clara winds up entering a magical world of four realms that her mother had a connection to and which she now plays a part in overseeing. Accompanied by a kindly solder (Jayden Fowora-Knight) she makes her way to the palace and meets the rulers of three of the lands that have been awaiting her arrival. Hawthorne (Eugenio Derbez) comes from the Land of Flowers while Shiver (Richard E. Grant, Can You Ever Forgive Me?) calls the Land of Snowflakes his home. The unofficial leader of the trio is the ever sweet but sturdy Sugar Plum (Keira Knightly, A Dangerous Method) who takes Clara through a tour of the realms and warns her of Mother Ginger (Helen Mirren, Red 2), the leader of the Land of Amusement, the fourth realm. As Clara takes in her surroundings, she decides to stay and help Sugar Plum get a special key from Mother Ginger that will help unlock not only a machine meant to protect the kingdom from Mother Ginger’s clutches but will also open a special egg of her mother’s. Journeying to the dark Land of Amusement with her solider is just one of the adventures Clara goes on and which introduces the first of several surprises along the way. 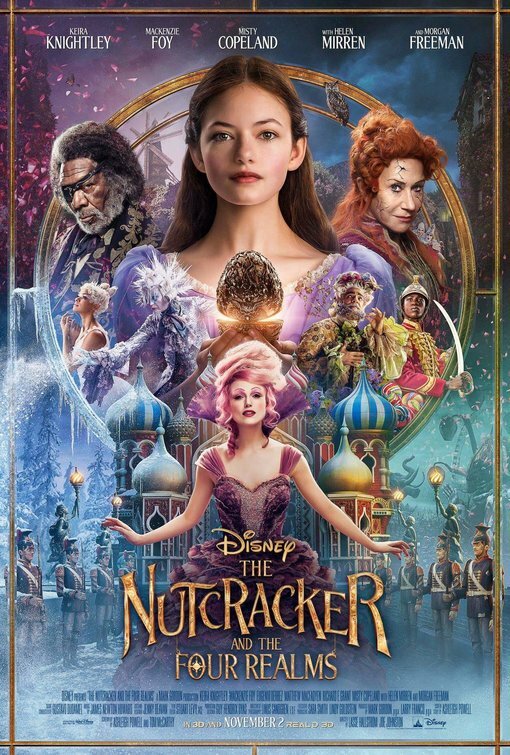 Continuing Disney’s tradition of turning celebrated classics into live-action extravaganzas, The Nutcracker and the Four Realms is stuffed to the brim with feasts for the eyes. Though the film bears the name that suggests it will follow Pyotr Ilyich Tchaikovsky’s famous music and seminal ballet, it’s only loosely inspired by the original short story by E. T. A. Hoffmann. That being said, there are numerous musical cues that will sound familiar, part of the cheery score supplied by James Newton Howard (The Dark Knight). One of the best moments in the movie is a centerpiece involving a ballet performed by famous ballerina Misty Copeland. Copeland’s got incredible charisma and her dancing nearly turns the movie into a 3D experience. If only she had more to do here, still, it’s more than easy to see why she’s risen to the top of her field. Foy is a lovely lead, head-strong and boasting a more than passable English accent. She’s in almost every scene of the movie so it’s important to have someone in that central role that doesn’t grate on the nerves. While we’re talking about nerves, I’m not sure what Knightley was going for but her lines are delivered with a baby voiced tweet that seriously bugged me right from the start. This is a fantasy to be sure but every time she opened her mouth I was jolted back to reality. Grant and Derbez seem to be literally hiding behind their costumes and I’m wondering if their roles were cut back in editing. As much as I love Mirren and Freeman, not a ton of effort is put forth on their part which is disturbingly becoming the norm for Freeman. While the production design is mostly fairy tale-perfect, some of the sets and costumes look like they’ve been in storage just waiting for another Santa Clause film. Disney has spent a boatload of money and it’s all up there on the screen for audiences to see. There are some that will find the film hollow yet pretty on the outside and maybe that’s a fair assessment but I found it an enjoyable bit of holiday entertainment on a scale we haven’t had in some time. Directors Lasse Hallstrom (The Hypnotist) and Joe Johnston (Jurassic Park III) never the let movie spin too far out of control and punctuate it with a lovely finale. Why Disney is releasing this movie so early in the season is beyond me. It’s likely they were weary of receiving a critical drubbing in a more targeted holiday release so instead they chose to open it just as the leaves were starting to change. I feel it would have been better suited to come out Thanksgiving weekend which would carry it into the Christmas holiday. I’m not yet in my Scrooge mood which is why I probably fell for the charms of The Nutcracker and the Four Realms a little easier than I normally would. I still would whole-heartedly recommend this as an ideal family film.